For some reason, I got bored with this book about 1/3 of the way in and put it aside. I should have held on and read just a little more, because when I picked it up again a few days ago, I found the rest of the story to be a very emotionally charged and engaging read which I was able to finish quickly. Mudbound takes place in Mississippi and follows the lives of its several characters from the years after WWI until shortly after the end of WWII. First there is Laura, a well educated woman who was saved from spinsterhood by Henry McAllan, a well meaning but unimaginative college graduate and veteran of WWI, who turned out to want nothing more than to be a farmer. 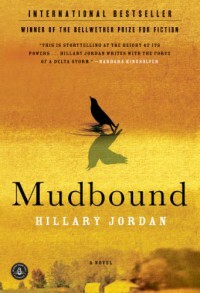 Ms. Jordan perfectly captures the loneliness and isolation Laura felt at being taken from her parents' home to live in a dilapidated shack with no electricity or indoor plumbing. Then there were Jamie, Henry's much younger brother, and Ronsel, the son of Henry's black tenant farmer, both just returned from Europe after WWII. They are both having a difficult time reintegrating themselves into the lives they left behind after witnessing firsthand humanity at its worst. Ronsel had the added baggage of having lived in a world that saw him solely an American man and did judge him based on the color of his skin. Lastly there is Pappy, Henry and Jamie's father, as mean and hateful an old cuss as you could ever hope not to meet. Their lives are forever changed one fateful night. Primarily, this is a story of wanting to do the right thing. Just like in real life, doing the right thing does not necessarily come easy. Sometimes their efforts succeed, and sometimes they don't, leaving them to sort out the chaos wrought by their actions. Also like in real life, doing the right thing does not guarantee happiness.